If you are not familiar with the panels that take place at the E3 Coliseum, then you know they provide a venue for a more intimate exchange between the speakers and the audience. Last year, Rare hosted their first panel where they talked about their passion, vision and expectations for the game. With the game now released, Rare took the opportunity to take questions and feedback from the community. Rather than have a big presentation, the team present had a more informal get together and held a Q&A with the audience. You can watch the panel yourself here which is highly recommended or get a quick rundown of the questions and the summarized collective answers below. The team representing Rare at the panel was Adam Park (Senior Brand and Licensing Producer), Joe Neate (Executive Producer), Mike Chapman (Design Director) and Shelley Preston (Senior Designer). Q: Do you have any future DLC planned out? Cursed Sails is one of the major content updates coming to Sea of Thieves and will release in July. This release centers around skeleton ships that have arrived in the Sea of Thieves. These skeleton ships will provide a great challenge for players to defeat and will bring with them cursed cannonballs. These cursed cannonballs can do things like lower the anchor of a ship it has hit or raise the sails. There will be curses that not only effect ships but also the players aboard the ships. The grogball for example that was mentioned will make the crew manning the ship drunk making it harder for them to perform their duties. The Cursed Sails update will also introduce a three player ship, the Brigantine. The Brigantine has two masts, two decks, and is tailor-made for three players. 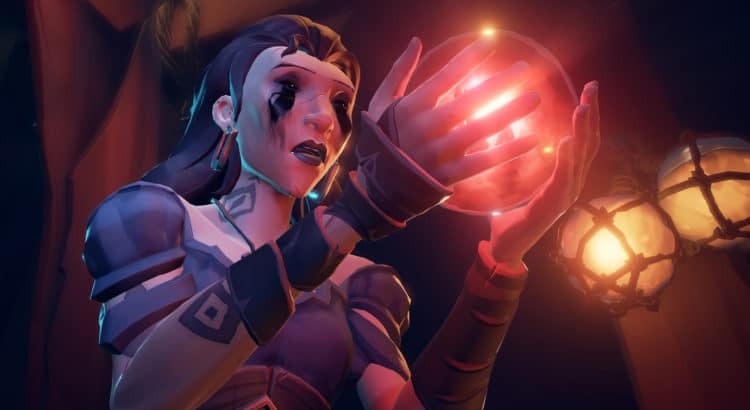 The next big content update for Sea of Thieves is Forsaken Shores which will be available to players in September. Forsaken Shores is all about making the world itself a threat. Forsaken Shores will introduce a new play area, the Devil’s Roar where the islands will be attacking the players with volcanic explosions. Along with this new dangerous area to explore comes rowboats for players to use. These rowboats will come in handy in the Devil’s Roar as players will want to dock their ship further from the island so they are not damaged by the volcanoes. The rowboat will help players cover the greater distance between the island and ship quicker and safer than swimming. Each of these updates has more content not mentioned that the team will talk more about as it gets closer to release. Q: What plans are there for Pirate Legends? The team’s focus immediately is to bring in goals for everyone. As seen with the Skeleton Thrones, it is a challenge and goal that all players can take part in and reap the rewards of. Pirate Legend specific goals will be coming as more and more players reach the status. Q: Thoughts on lack of player punishment for dying and having ship sink? The team originally planned a death tax as it became to be known. Players would have to pay the captain of the Ferry of the Damned each time they would die. A problem this creates is players are going to become risk averse. A lot of the memorable moments in Sea of Thieves come from players willing to take risks. Rare is looking to explore the idea of in-session progression to deal with the idea of punishment. An example of this in-session progression being a player having collected several explosive barrels and cursed cannonballs. If that player loses their ship, they lose those items which they have taken the time to acquire. Rare has also addressed the ship spawning distance issue the community had been bringing up. When you sink a ship, it will spawn farther away before giving the surviving ship some more breathing room. Q: Will there be any way that more ships will be able to queue up together? If I have more than three other friends, how can we all play together? Rare has heard the feedback of wanting more than just you and three of your friends being on the same server. Rare is looking into a way for players to get into a game with a large group of ships and splitting them across multiple ships. Though, there are no immediate plans right now for such a system. Along the same idea, Rare has toyed with the idea to formalize alliances in-game. This would mean two crews could form an uneasy alliance where they could still hurt each other but share rewards. Q: Do you have plans for more enemy types other than skeletons? Something interesting the team wanted to do with Forsaken Shores was make an unexpected enemy, the actual islands themselves. With the islands having volcanoes on them, they will act just as much as an enemy as a shark or skeleton would. Also, Sea of Thieves is a pirate fantasy world. The team will explore all types of enemy types other than skeletons. Q: Will we see more awesome lore around Captain Flameheart and Bell from the Sea of Thieves book? The team has done a pretty good job of lore but most of it is outside the game. The team is experimenting on the best way to introduce lore in the game. Rare first did this with The Hungering Deep and Merrick. You just didn’t go out there and fight the Megalodon. The player learned the backstory of the giant shark and what its place is in the game world. With each new big content update, you can expect a campaign about why these things are happening in Sea of Thieves. These campaigns will be a guided tour of the new content and help the player understand the new tools and threats. Q: Is there talk of adding more songs or getting to choose your song? Merrick’s shanty is now available to all players. Rare really likes the idea of shanties being earned and players possibly having different shanties. Even though one person has a shanty that the other doesn’t, they still can harmonize and play the song. The team has also been working on some tech, music streaming, which will allow more songs in the game. Q: Why don’t you give a curse to people who die giving the dead players downtime before they can continue with their previous goal? As mentioned before, if you put too much of a penalty on the players for dying, you end up with players not taking risks anymore. This could also cause the crew to split up as a part of the crew has to go lift the curse. This burden of the curse could also cause strife between the crew. Q: Do you plan on adding any other modes of transportation? Parasailing or other air transportation? For pirates? Seems unlikely. Also creating equally “Great Air” to the already “Great Water” would be a huge undertaking. Expect Sea of Thieves to stay grounded in water. And there you have it! It was a fun half hour of Q&A with lots of great questions and informative answers. If you have the time, we definitely suggest you watch the whole thing yourself. There was plenty more talked about that we didn’t cover here.